We have nothing against pints… usually. But sixteen ounces can be a lot of beer in certain situations (don’t get us started on the boot, which is larger than Erica’s head and heavier than a newborn). We just happen to like things on the smaller side. That’s why when we started teaching people how to make beer, we did it on the one gallon scale instead of the ubiquitous five gallon setup. 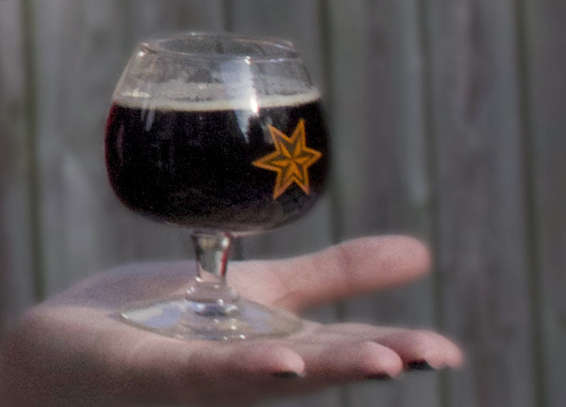 At breweries and bars we line up as many tasting glasses as the table will hold. It’s not uncommon to spot us huddled over a dozen four-ounce glasses sticking our noses in each one before every sip. We love variety; we love surprises. So it’s not an actual surprise that when we created our own beer making kit we decided to go small too. For us, brewing small and drinking small means sharing and appreciating more. And to clarify small doesn’t mean less. Small means you can try that weird sour beer from Flanders or that beer you’ve been hearing about from some fifteen-barrel brewery out of Red Hook (just imagine you weren’t reading this on their website and already in love with them). Not all beer is for everyone. A full pint of your favorite Imperial Stout or Rauchbier might be enough to drive your not-so-beer-loving friend back to gin and tonics for the night. It could be weeks before you convince him or her to give good beer another go. With half-pints or tasters, ask your friend what’s good or bad about the beer, and move on to the next one. It can be mere minutes before the right style is discovered (as long as you’re willing to finish a few ounces of beer on your friend’s behalf). Now that you have a new beer-loving-friend thanks to small pours, it’s time to get the two of you brewing. And there too, we say go small. When brewing on a small scale, you can use the same ingredients you’ll find in your favorite breweries. You can start with grain and skip using extracts and powders altogether. On a small scale, brewing feels more like cooking. You’re using the same pots and spoons you would use to make pasta or oatmeal. You can totally geek out, or you can steer clear of the science of brewing as if you were cooking (How many times do you really reference the Maillard reaction when grilling steak? Or is non-enzymatic browning your thing?). Brewing small batches means brewing more beers. A stove with multiple burners means brew day yields multiple batches. This is great for testing (Q: How many juniper berries should go into a gin inspired beer? A: After extensive testing, we learned one teaspoon crushed per gallon is perfect.). It’s ideal for emboldening your ingredient list (lobster shells are great, cedar not so much). And it’s great for variety. And while we love brewing five-gallon batches, having fifty bottles of your favorite beer may quickly result in its not being your favorite beer for long. Variety keeps every beer fresh. And what’s better than a fresh beer? Erica Shea & Stephen Valand are the Co-Founders of Brooklyn Brew Shop and author’s of Brooklyn Brew Shop’s Beer Making Book: 52 Seasonal Recipes for Small Batches.